Assumptions include accurate information on business operations, such as expenses and revenue. Financial projections use the assumptions to make future financial predictions. 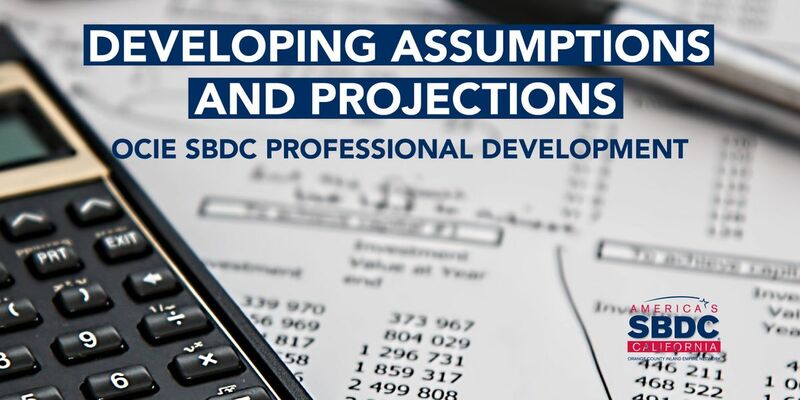 Mike Daniel, Karie Armstrong and Paul Nolta will provide you with their own unique ways on how to create and work through assumptions and projections for SBDC clients. They will also go through different case studies. Mike Daniel is the Regional Director of the Orange County Inland Empire SBDC Network, which assists aspiring entrepreneurs and current business owners throughout Orange, San Bernardino and Riverside Counties. Mike was formerly the director of the SBDC office at Long Beach City College from 2010 to June 2015. As business owner and entrepreneur himself, he started his career as the owner of a Rocky Mountain Chocolate Factory location in Manhattan Beach and went on to open a second location in Long Beach in 2001. At their peak, the locations had a total of 20 employees and both locations had managers and assistant managers. In 2007, Daniel sold the Manhattan Beach store for an above-market offer then invested in several additional locations as a minority shareholder. Mike currently owns a new venture located in Shoreline Village in Long Beach called, Sugar Daddies Sweet Shoppe, based on “fill-it yourself” candy options. Karie Armstrong has more than 25 years of experience helping retailers, service providers, restaurants and entrepreneurs successfully launch and grow their businesses in a wide variety of retail environments and markets. Her extensive back ground stems from shopping center management, marketing and development, as well as retail operations and manufacturing. Karie has served on various Economic Development Advisory Committees and Chambers of Commerce during her career. She has been a SBDC Consultant throughout the Orange County/Inland Empire, Long Beach and San Diego areas for seven years and counting. After serving this country in the Air Force, Paul graduated from San Francisco State University with a Bachelor of Science degree in Business Administration, with an Emphasis in Finance and a Minor in Entrepreneurship. He previously worked as a financial advisor and enrollment manager for a major benefits administration company. He has an extensive background in financial analysis and business planning. Paul operates SBDC Outreach offices in both Murrieta and Temecula.